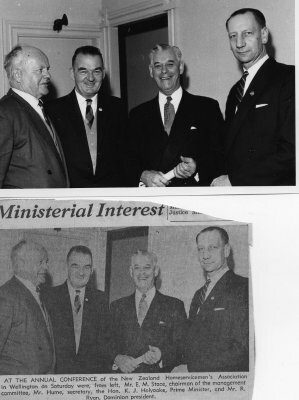 Description Photograph and newspaper clipping of Mr E.M. Stace; Mr Hume; Prime Minister K.J. Holyoake; Mr R Ryan. Photograph taken at the annual conference of the New Zealand Homeservicemen's Association, August 1961.